I am writing to formally request that the Newby Island Expansion Permit be denied at the October 26 meeting or defer the decision in light of evidence of substantial changes that have occurred since the original 2012 EIR certification and zoning approval. Please review the presentation file attached. Also monumental is the fact that San Jose Planning Staff had been analyzing “Alleged Source” from BAAQMD when their report and recommendation was published. It is extremely irresponsible to draw any conclusion based on “alleged” data. I had brought this to Ms Whitney Berry’s immediate attention last week. Mr John Marvin, BAAQMD Compliance and Enforcement Division Manager, had confirmed my findings on the data discrepancy. He has supplied the valid “Confirmed Source” data to City of San Jose yesterday. Appended below is our email correspondence documenting this finding, together with the corrected spreadsheet. Until the new and valid data is thoroughly analyzed, it would be premature to hold a public hearing on Wednesday based on invalid data. BAAQMD data represents the most comprehensive investigation into odorous sources over an extended period of time. Their data should be given far greater weight than ERM Odor Study which covered 2 arbitrarily weeks. BAAQMD confirmed complaints data clearly showed that the ERM prediction is underestimating the frequency of odor impacts onto surrounding communities. I cannot stress enough that it is against City of San Jose’s Municipal Code to permit any project that is a public nuisance. The landfill in its present state already impose significant negative impacts on the of thousands who live, work, shop & play surrounding Newby Island. 20 open regulatory violations from BAAQMD, including 5 for landfill public nuisance, and 10 other violations from CalRecycle, LEA and RWQCB within the last 2 years is clear evidence of Republic Services’ poor conformance and operational track record. I hope you didn’t forget how Republic Services have lied through their teeth at past public hearings, denying odor responsibility and tried to blame others. I have very low confidence in Republic Services’ ability to mitigate odor. They spent $27 millions in odor measures at their Sunshine Canyon Landfill, and violations persist. 2 Order of Abatement had to be pursued by Air District to modify their permit after expansion was approved. This is evidence that effective mitigation does not exist no matter how much $ is invested. Sound public policies must be made to stop urban landfill expansions. Please take a lesson from the Tullytown Landfill closure and order landfill closure plan instead. It is an obligation for public officials such as you to protect public welfare. Update: Republic requested the item be deferral. This was granted and the next meeting will be in December. San Jose City Staff is recommending approval of Newby Island Landfill Expansion. Please join us for a rally and asking Planning Commission to deny Newby Island Landfill Expansion. Will stage a Rally and meet with media at 5:30pm. I have very low confidence in Republic Services’ ability to mitigate odor. They spent $27 millions in odor measures at theirSunshine Canyon Landfill, and violations persist. 2 Order of Abatement had to be pursued by Air District to modify their permit after expansion was approved. This is evidence that effective mitigation does not exist no matter how much $ is invested. Sound public policies must be made to stop urban landfill expansions. Please take a lesson from the Tullytown Landfillclosure and order landfill closure plan instead. It is an obligation for public officials such as you to protect public welfare. 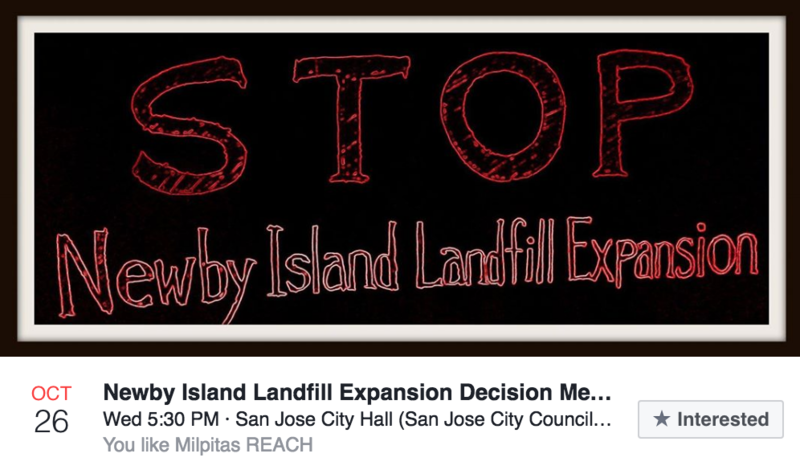 Recently I was contacted by community leaders and residents of the cities of Milpitas, Fremont, and San Jose concerning the upcoming San Jose Planning Commission meeting to consider the appeal of the proposed expansion of the Republic Services Newby Island Landfill. As a result of concerns raised by the community on the validity of the data submitted by BAAQMD, the analysis of data by the City of San Jose, and the need for additional time for the community to review the new data, I have requested that the matter be continued until January 2017. I have attached a copy of the letter I sent to the Mayor of of San Jose, the City Council, and the San Jose Planning Commission. Although I and other community leaders have requested the continuance, the community should be prepared to attend the meeting on October 26, 2016 to express their concerns about the project and City staff’s recommendation. There is no guarantee that the item will be continued to another date. For years, I have heard from my constituents in Milpitas, San Jose, and Fremont who are impacted by odors emanating from the landfill. As your representative, I will continue to advocate on your behalf so that your concerns are heard by the City of San Jose.